In the 1950s, newcomers to origami relied on books with instructions to learn the craft. Today enthusiasts can learn how to fold via Youtube. This may be reducing regional variations in the craft. Nguyen says that origami ranges from highly scripted to totally freestyle: "Origami can be very formulaic, with a set of precise, calculated steps to follow, or it can be improvisational, where you feel and sculpt the paper until the result meets your satisfaction." Vietnamese artist Tran Trung Hieu creating this work, which includes both creases and gentle bends. 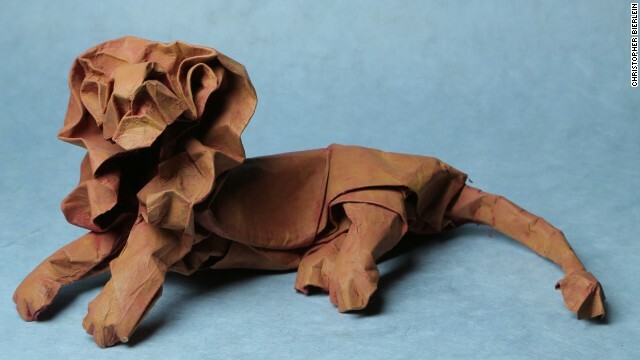 Origamists from Vietnam have mastered the technique of wet-folding, in which artists dampen the paper, allowing them to create gentle bends rather than sharp creases. 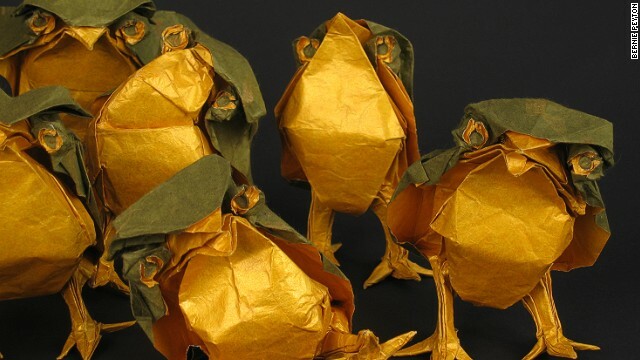 Origami artist Bernie Peyton created each of these baby owls using just one sheet of paper, which was gold on one side and green on the other. 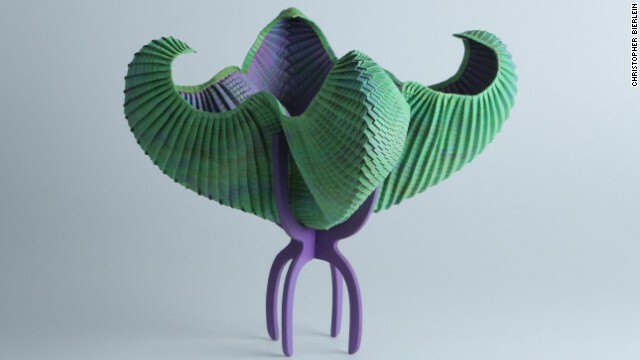 "Origami can be used to create incredibly realistic forms," says Uyen Nguyen, curator of the upcoming Surface to Structure: Folded Forms exhibition at Copper Union. "Not just to the likeness of say, an insect, but down to the exact species of that particular insect with proportions of its body segment true to real life." Designed by Ronald Koh and folded by Ng Boon Choon Singapore/Malaysia, these rabbits show the artists' attention to detail. The Surface to Structure exhibition includes 130 works from artists on five continents. 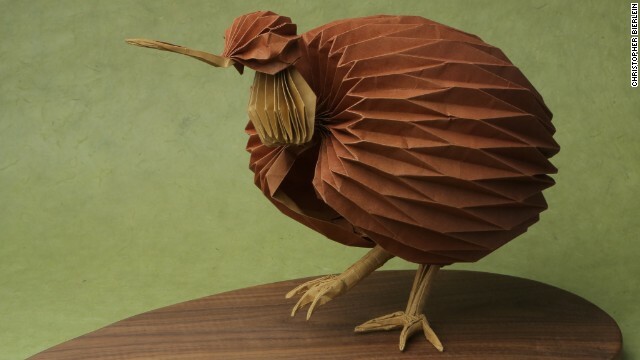 Among the pieces is this depiction of a Kiwi, by Bernie Peyton. It is instantly recognizable by its long down-curved bill. Belgian and German artists also used gentle bends for this lion. This form depicts the vole, a small, mouse-like rodent with a rounded muzzle, found in Europe, Asia and North America. 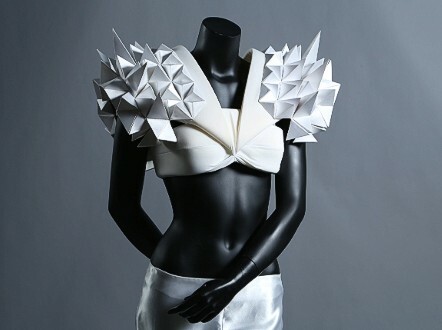 "I am also showing the many genres of origami, including a fashion segment, which isn't typically considered to be a standard category of origami," Nguyen says. Shown here is the "Enfaltung" dress by designer Jule Waibel . American origamist Byriah Loper created this work of modular origami. As Nguyen explains, "Modular origami uses multiple sheets of paper, folded into identical units, and takes these units and interlocks them, without cuts or adhesive, to obtain a final form that is usually very angular and representative of geometric solids." Erik and Martin Demaine created this swirling work. 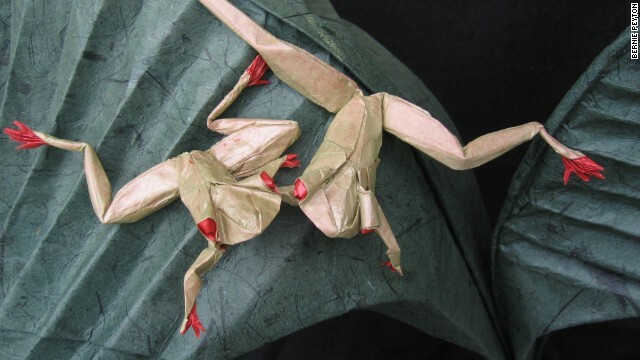 Nguyen says they are among the only origami artists to cross over into the mainstream. "[They] have a few pieces which are part of The Museum of Modern Art's permanent collection," she says. 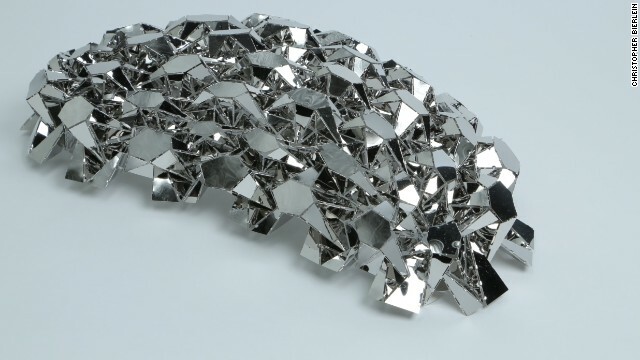 Tomohiro Tachi of Japan created this shiny work. "I find that the Japanese tend to be more calculated and precise with their folding," Nguyen says, "which can allow for a huge amount of detail and complexity." The possibilities for origami keep expanding. "The most major change over the past twenty years is that artists have begun to write software to help them design their forms," Nguyen says. "Others have taken the style in a different direction, opting for more abstract, concept-driven structures than representational models." 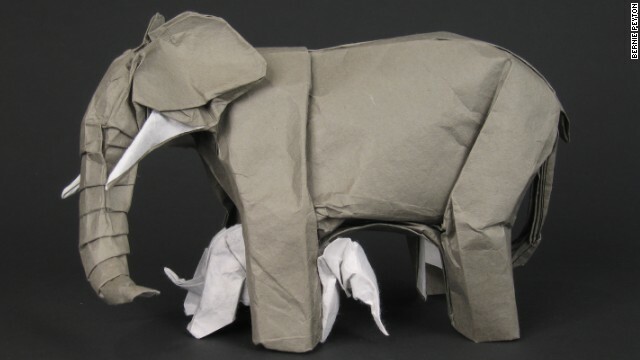 Today, origami artists use software to help them design their intricate creations. (CNN) -- When origami enthusiast Uyen Nguyen discusses her art, you quickly understand that it is about a lot more than folding paper. "In many ways it has been therapeutic," she says. 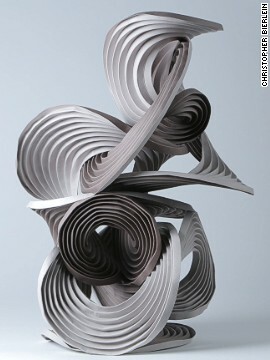 "I find the process of folding paper to be almost meditative. "Origami can be used to create incredibly realistic forms, not just to the likeness of say, an insect, but down to the exact species of that particular insect with proportions of its body segment true to real life. At the other end of the spectrum, you can mold paper to create the most abstract of forms beautiful because of their inherent structure instead of their likeness to real life forms. As someone interested in both science and art, I love that origami bridges the two." Now Nguyen is bringing her passion to the people of New York City. As someone interested in both science and art, I love that origami bridges the two. For the exhibition Surface to Structure: Folded Forms, which will take place at New York's Cooper Union from June 19 to July 4, Nguyen has gathered more than 130 works from 88 artists around the world. 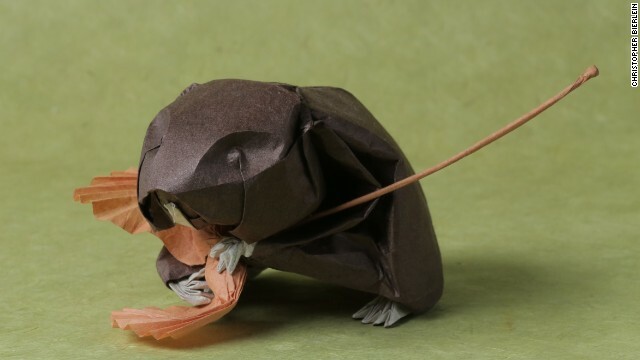 The exhibition includes adorable rabbits folded by Malaysian origamist Ng Boon Choon, and a realistic rendering of a field mouse by American Bernie Peyton. 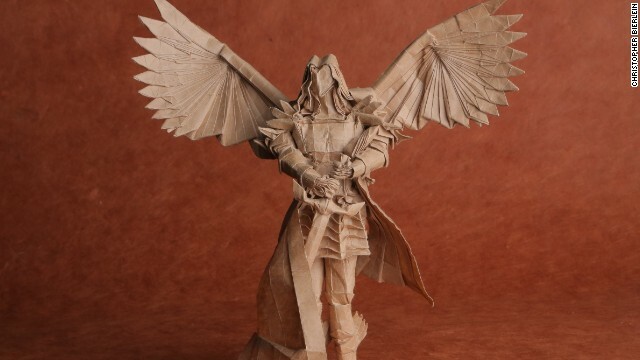 But it also includes "St. Michael -- The Archangel", a more ominous work by Vietnamese origamist Tran Trung Hieu. It shows a winged angel carrying a sword. The exhibition marks the 55th anniversary of the 1959 exhibition Plane Geometry and Fancy Figures -- the first origami exhibition held in the United States, which also took place inside Cooper Union. So far Nguyen has raised more than $24,000 of the $32,000 she needs to cover the cost of shipping the works, organizing security and building display cases. 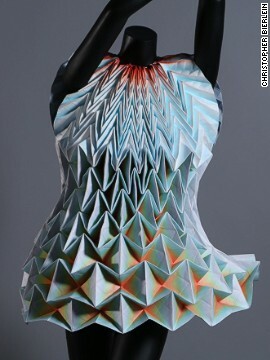 Origami can also be used to make avant-garde fashion creations, such as this one by Czech designer Hana Coufalova. 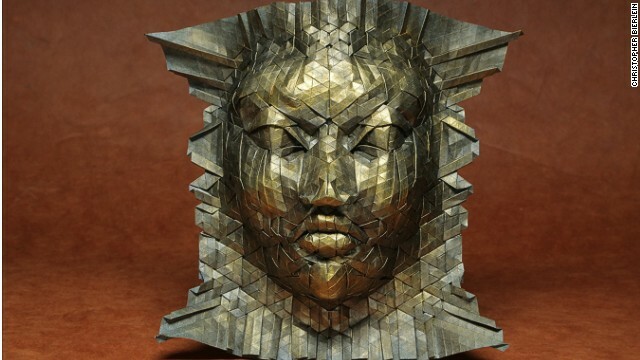 Collectively the works demonstrate how origami artists are pushing the boundaries of technique and style. In the 1950s, Japanese organist Akira Yoshizawa helped popularize the art by creating a universal system of diagramming, which involved arrows and illustrations rather than words. His book allowed people across the world to learn the craft and to easily construct pre-existing designs. But today artists have moved beyond that, with many using software that helps them dream up and then fold their elaborate works. In many ways it has been therapeutic. I find the process of folding paper to be almost meditative. 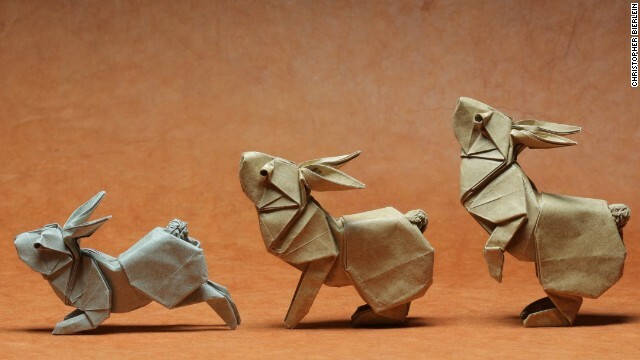 "Most origami involves folding one sheet of paper into some final form," Nguyen says. 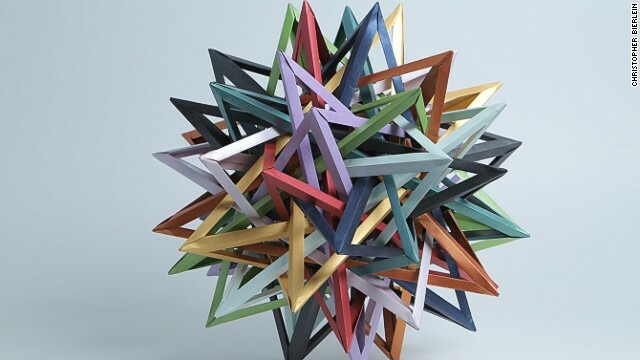 "Modular origami uses multiple sheets of paper, folded into identical units, and takes these units and interlocks them, without cuts or adhesive, to obtain a final form that is usually very angular and representative of geometric solids. A couple of my designs add embellishments onto the surfaces of these polyhedra." Regional variations in the art are becoming smaller and smaller as more people learn about origami via the Internet. However, Nguyen says that she observed a few patterns among artists while curating her exhibition. Vietnamese artists tend to be masters of wet folding, which creates soft, gentle bends rather than sharp creases. "Their styles can be somewhat minimalist, and there is so much beauty in their simplicity," she says. "The Japanese tend to be more calculated and precise with their folding, which can allow for a huge amount of detail and complexity. I think the European style of origami lies somewhere between these two extremes."